Captain James T. Kirk (Chris Pine), in Star Trek: Into Darkness (2013). I now understand that the thing which really primed me to enjoy and appreciate Star Trek: Into Darkness (2013) is...Baz Luhrmann’s The Great Gatsby (2013). I screened that movie adaptation of F. Scott Fitzgerald’s 1925 novel on opening day, and was blown away by how relevant, experiential, and intimate the director had made the familiar material. But negative reviews be damned, Luhrmann has revitalized Gatsby and made it live and breathe for modern audiences. Rap music, 3-D photography, and other contemporary stylistic touches have rendered it entirely of the moment, and will open up an understanding of Fitzgerald’s work for generations yet to come. For example, Luhrmann’s modernization of the work permits viewers to understand that the American Dream hasn’t changed much hanged in ninety years -- nor has Wall Street -- and thus help us to identify with Nick and Gatsby in a way that a traditional period piece simply would not. Well, Star Trek lives again too, and in very much the same fashion I describe above, thanks to the efforts of J.J. Abrams and Into Darkness. Although it may be sacrilege to say so in some circles, there are probably folks who would also consider Star Trek a “dead text” at this point. The franchise began almost fifty years ago, and the milieu which gave rise to it -- Kennedy’s Camelot -- began and ended before I was even born. However, in ways large and small, epic and intimate, Star Trek: Into Darkness breathes fresh life into the franchise, and makes it relevant to today’s world. Although the narrative concerns the future of the 23rd century, the movie is really about today -- the world around us -- and its message is transmitted in the way that contemporary audiences can best receive it: in 3-D, with lots of lens flare, and in J.J.’s preferred mode of expression: pastiche. The film’s story is not -- as I had feared and fretted -- all about a revenge-mad terrorist armed with a weapon of a mass destruction, but rather about the ways that heroes respond to acts of terror, and fear. 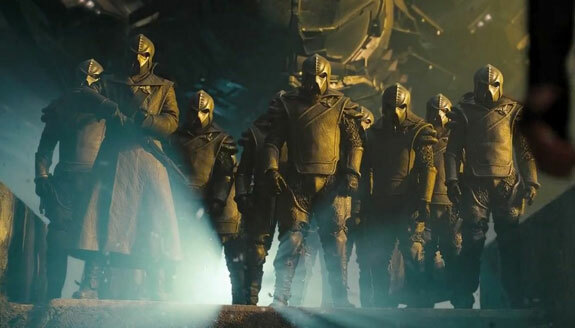 In short, Into Darkness is a spell-binding, thrill-a-minute film that accomplishes the one thing that the 2009 reboot did not, and which I desired to see more than anything else in a sequel. Star Trek: Into Darkness restores the Gene Roddenberry franchise as a vehicle for social commentary by noting that the bad guys win when we go “dark” in response to bad deeds. 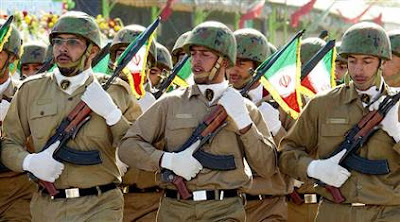 Accordingly, the film plays as a recap of the difficult "War on Terror" years since 2001, years in which America condoned torture, holds suspects in perpetuity without trial, launched a pre-emptive war, and has relied on advanced, push-button technology to destroy enemies from afar, in violation of law and perhaps morality. Into Darkness is about who we have let ourselves become…all out of irrational, overwhelming fear and anger. But, as Star Trek has long suggested, the best way to battle darkness is to bring it into the light…to expose it for what it is. To my delight, this J.J. Abrams film understands and transmits that notion in a fashion that a dozen interchangeably “dark” superhero movies simply do not. Kirk in this movie is angry about his loss and looking for vengeance, but because of his friendship with Spock, Scotty, and others, he is soon able to see that revenge cannot be the quality that defines him. He's better than that. We should be better than that too. The purists will complain -- just as they complain over Gatsby, and just as they complained when The Next Generation first premiered in 1987 -- but in their stubborn refusal to accept the passage of time and embrace modern audience appetites and movie techniques, these folks will also miss out on the best and most relevant Star Trek movie in possibly thirty years. 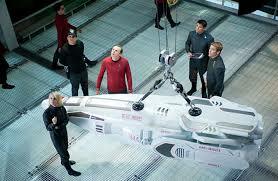 In Star Trek: Into Darkness, the U.S.S. Enterprise under command of James T. Kirk (Chris Pine) undertakes an unauthorized mission on the inhabited world Nibiru. Upon return to Earth and Starfleet, Kirk is called on the carpet by his superior at Starfleet Command, Admiral Pike (Bruce Greenwood), for his actions on Nibiru. Those incidents were reported by Spock, who Kirk saved from certain death on the planet. Spock believes Kirk should not have violated Starfleet Regulations, while Kirk believes that Spock should have trusted him. Meanwhile, the shadowy John Harrison (Benedict Cumberbatch) -- an agent for the secretive security branch of Starfleet called Section 31 -- goes rogue and launches two terrorist attacks against his former superiors. He destroys an archive in London, and attacks command personnel in San Francisco. Captain Kirk requests permission to pursue the terrorist to the end of the galaxy if need be, and in that quest is provided a new, highly-advanced weapon by Admiral Marcus (Peter Weller): 72 highly-advanced stealth torpedoes. Marcus orders Kirk to go to the edge of the neutral zone near Klingon space, where he is to fire the torpedoes from a safe distance at an uninhabited province on the alien home world of Kronos. There, intelligence suggests, Harrison is believed to be hiding. Spock objects to a kill order for a man who has not even stood trial for his crimes, and Scotty (Simon Pegg) resigns his commission rather than take aboard 72 weapons of unknown origin that could damage the Enterprise. Upon reaching the neutral zone, Kirk reconsiders his orders, and takes a team down to Kronos to arrest and bring back Harrison. One important thing to understand about Into Darkness is that it is indeed the victim of a terribly generic marketing campaign. Previews and trailers stress a mad man, acts of terrorism, and even the dreadful line “I will have my vengeance,” which -- if memory serves -- does not appear in the film. As I described in my post, Threading theNeedle, the advertisements and posters evoke memories of The Dark Knight (2008) and Iron Man 3 (2013). he movie isn’t angst-ridden or broody, or particularly dark for the apparent sake of narrative and thematic “maturity.” It isn’t a film about ugliness. Instead, Into Darkness is about finding the best within oneself when times are worst, and that path of light being the key to dispelling encroaching darkness. In terms of the social commentary, Star Trek’s (2009) destruction of Vulcan is now, clearly, the 9/11 of the franchise and the galvanizing incident behind the plot line of the sequel. Star Trek: Into Darkness follows-up that context, and reveals a Starfleet Command in chaos and confusion over how to respond to looming threats. There is a direct, multi-faceted parallel between the years 2001–2013 and the events in the new Trek timeline. I’ll enumerate as many as I can, for they are legion. John Harrison, the villain of Into Darkness is a former agent of Section 31, a shadowy covert organization in Starfleet. He was "awakened" by Admiral Marcus and trained in 23rd century technology and intelligence to help Marcus countenance looming threats such as the Klingon Empire. 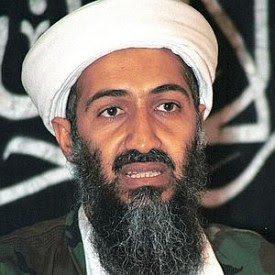 Osama Bin Laden, the late terrorist who struck America on September 11, 2001, is, in some circles, believed to have been trained by the CIA (corollary to Section 31, in Star Trek) to battle the Russians in Afghanistan with the mujahedeen. In this case, Harrison also turns against those who trained him, and uses that training and knowledge to strike back at his former masters. After two devastating terrorist attacks on Starfleet and Earth, in London and San Francisco, Harrison escapes without a trace to an uninhabited province in unfriendly territory. Historically-speaking, we know that Bin Laden sought sanctuary in the rough mountain patch separating Pakistan from Afghanistan, particularly the inhospitable landscape of Tora Bora. Bin Laden’s proximity to a sovereign country possessing nuclear capability and a population by-and-large hostile to America, became a central issue in tracking him down, and contending with him. That precise dynamic plays out in Star Trek Into Darkness as Kirk must negotiate his proximity to the Klingons, and not allow Starfleet to become visibly involved in an incursion into such sovereign territory. Provoking the Klingons -- like provoking Pakistan -- could mean "all out war." Finally, John Harrison is called his full-name only once in the film, and though it is abundantly familiar to Star Trek fans, it plays differently in terms of the post-9/11 milieu. Khan Noonien Singh sounds not entirely unlike Osama Bin Laden. Three word names, both consisting of apparent Middle Eastern-sounding origin. This resemblance may seem slight, but played out in this alternate universe timeline, I believe the connection is significant. The way to get and destroy Harrison, ostensibly, is by use of new, modified 23rd-century torpedo in Star Trek: Into Darkness. These torpedoes can be fired from a great distance to destroy the terrorist. As others have written persuasively, this aspect of the Star Trek plot boasts a clear corollary with our continued drone attacks in foreign countries, including Yemen, Afghanistan and Pakistan. This “push-button” war raises questions of morality in both circumstances. In neither instance is there a declared state of war, and therefore no permission to launch decapitation strikes deep inside sovereign territory. But in both cases there exists the opportunity to kill with impunity, without repercussions, and to do it in such a way as there are no casualties for the “heroes.” This opportunity tends to make war seem "clean" and "pretty," especially to a detached citizenry. No pilots endangered, no boots on the ground. Just death from above, and from a great distance. Following Al-Qaeda’s surprise attacks on New York City and Washington D.C. on September 11, 2001, the Bush Administration immediately began conceiving a way to legitimize a war…with Iraq. Al-Qaeda was headquartered in Afghanistan and had no links to Iraq or its despotic ruler, Saddam Hussein, and yet the Administration began to lobby for war with that state. In Star Trek: Into Darkness, Admiral Marcus is similarly, unhealthily obsessed with the Klingon Empire and believes that war with the Empire is inevitable. He is looking ahead to a next, possible enemy, instead of dealing with the enemy that already exists (John Harrison). Accordingly, Marcus and Section 31 have begun to hyper-militarize Starfleet, and laid the ground-work for a new war against an enemy who has not yet struck. The U.S.S. Vengeance, a super-battleship, has been secretly commissioned for a war that, as of yet, has not been launched. In fact, a torpedo strike into Klingon territory would be just the thing to give Marcus his desired war, wouldn’t it? And at one point in the film, Marcus yells at Kirk that if war comes, Starfleet needs a decisive man like him making decisions, calling the hard shots. In other words, he's the decider. And if Starfleeet dare pick someone else, someone open to facts instead of fear (someone like John Kerry or Jim Kirk perhaps), you might risk "nuclear mushrooms" over American cities. The corollary to the War on Terror Age couldn't be more precise. Star Trek: Into Darkness also suggests that because Starfleet boasts clear regulations and orders of conduct that its officers must heed and obey, other, less “principled” soldiers may be required in the event of war with the Klingons...to fight in accordance with Marcus’s cut-throat new principles (learned from Khan?). Accordingly, U.S.S. 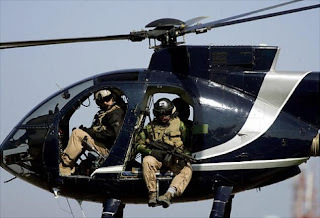 Vengeance is manned with “private” security forces, just as a private security firm, Blackwater operated in Iraq. The idea here, roiling under the surface is that Starfleet Regulations -- like the Geneva Conventions -- are "quaint" relics of a bygone time, not to be honored in a time of war-mongering and fear-hysteria. Good soldiers no better than to break the laws of engagement, but what about hired guns? In Star Trek: Into Darkness, Captain Kirk accepts John Harrison’s surrender, and then spends the next minute-and-a-half beating him, attacking his prisoner for his murderous deeds in London and San Francisco. But Harrison is stoic, and endures the abuse without pain, or even expression. Finally, Kirk must stop. He has achieved absolutely nothing through his display of brutal and primitive violence. He has not weakened Harrison, and he has not learned anything whatsoever about Harrison’s motives or plans. Notably, Kirk only succeeds in hurting himself -- embarrassing himself, too -- in physically attacking his prisoner, a man in his custody and therefore under his protection. This brutal physical assault has the effect of making him look weak, not Khan. Worse, it makes Kirk lose the moral high ground for a time. And again, that’s exactly what happened to America at Abu Ghraib and in covert CIA bases the world over. Instead of living up to our ideals about how to treat prisoners, we sacrificed our ideals out of fear and anger. One of the most intriguing aspects of Star Trek: Into Darkness is that its writers show the courage to diverge from our dark recent history in their idealized version of the future. Kirk eventually realizes it is wrong to kill a man from a distance without benefit of a trial. He hunts down Harrison/Khan and captures him for just such a trial (though we don’t see it). The best way to deal with terrorists is in the light of day, not in the shadows. In real life, we know that Bin Laden was hunted down and executed without trial, an act of revenge that in no way illuminates America’s true and hopeful nature as "the shining city on the hill." The point is that we have to be better than our enemies in our beliefs. That's what attracts allies to America; that's what makes us strong. Star Trek: Into Darkness thus suggests that the “good guys” win when they remember their true values, not when they descend to the level of barbarian, or give in to passing surges of blood-thirst or vengeance. This subtext represents a very Star Trek-kian principle, and I am happy to see it enunciated in an age of such thoughtless violence. Every other blockbuster movie is about a hero meting revenge for some terrible wrong. It's nice to see a blockbuster, for a change, where the heroes stop short of vengeance, take a breath, and remember who they are. 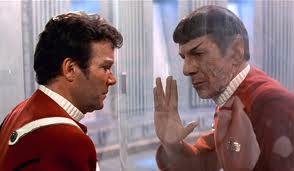 The Mirror Crack’d: Into Darkness as a Pastiche affirming the universality of the Kirk/Spock Bond. J.J. Abrams’ preferred mode of operation, I would submit -- based on his film career -- is pastiche. You can see it clearly in Super 8 (2011), a film that dynamically apes the Spielberg filming style, and uses and adapts elements from Close Encounters of the Third Kind (1977) and E.T. The Extra-Terrestrial (1982). I have read some complaints by Star Trek fans about the ways that Into Darkness “apes” previous moments in Star Trek history, namely the denouement of The Wrath of Khan (1982). A pastiche, of course, is an artistic work “in a style” that imitates that of another work or artist. But I would submit where a film like Nemesis apes the plot-line of The Wrath of Khan, Abrams goes one better with his frequent, post-modern nods to the Trek franchise. His Star Trek is set in a different timeline, in an alternate universe (not unlike the Mirror Universe, for instance), so some events actually have legitimate cause to repeat. History is going to repeat itself, more or less. And it is in the excavating of that "more" or "less" that Abrams seems to have so much fun. The point seems to be that no matter how much the "new" time-line alters the course of cosmic events -- like the destruction of Vulcan -- some events are indeed pre-destined, or pre-determined Kirk and Spock are meant to join up…in every universe. And Kirk is meant to be Captain of the Enterprise in all realities too, at least for a time. John Harrison/Khan fits this same template of pre-destiny. In any universe, Kirk and Khan are going to meet, clash, and he will only be defeated by, in the words of Prime Spock (Leonard Nimoy), "a great personal cost." The only thing that can defeat this powerful villain, is the combined force -- and friendship -- of Kirk and Spock. In the canon universe, it is Spock who dies to save the Enterprise. In Into Darkness, it is Kirk who goes into the warp core to face his own death. This is not a blind, empty repetition of Star Trek lore, it is an outright assertion of the importance of the Kirk/Spock relationship, and its value in the face of villainy. Those viewers who see Into Darkness as merely ripping-off the Wrath of Khan are missing the point entirely. Instead, the “mirror” scene of Into Darkness at the reactor core is a beautiful statement about Kirk and Spock’s connection in any reality. They will always be friends and they will always be willing to sacrifice themselves for their family: the Enterprise crew. Khan will never win, in any universe, because he lacks the special bond that Kirk and Spock share. The very thing that some Trekkers complain about as a weakness is, in fact, a strength of the film, and also of Abrams’ vision of Star Trek. He is not repeating what has happened before, he is revealing to us how, in the face of a “mirror” universe, some values such as friendship -- and Starfleet Regulations -- endure. This appreciation for Abrams’ modus operandi does not preclude me from criticizing certain aspects of the drama, however. 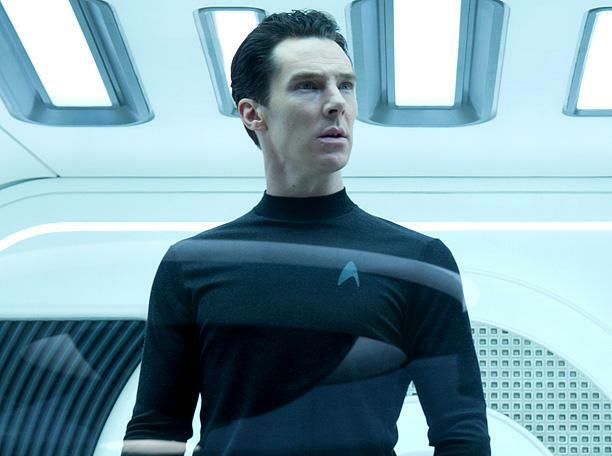 Although everyone has bent over backwards to appreciate Benedict Cumberbatch’s villainous performance as Khan, I would suggest his success in the role arises from his own qualities as an actor, and not the writing of the character. I recognized him as a strong presence in the frame, in other words, but not as Khan. I recognize Pine and Quinto and the others as the Enterprise crew, but the writers have brought almost no “old series” signifiers to allow permit long-time viewers to recognize Khan as the same man from “Space Seed” or Wrath of Khan. Would it have been too hard to have Cumberbatch quote Milton, or Dante, or Melville, just to remind us old folks he’s the same fellow from Space Seed? There is precious little of “Khan” in the writing of the Khan character in Into Darkness, which makes him seem a more generic villain than need be. It’s a good thing they cast an actor with such strong physical and intellectual presence, but watching the film, I never felt like this Khan was the same man I had met before. Cumberbatch brings immense focus to the role, but not the larger-than-life theatricality of Montalban. I missed that aspect of the character, as well as his sense of literacy and history. I also feel that some of the changes in this time-line are going to cause problems for the writers down the line. If a man can trans-warp beam from San Francisco to the heart of the Klingon Empire, there is no need for Star Trekking of any kind whatsoever. Somehow, future movies will have to address the fact that the transporter device is now a better, more efficient means of travel than starship and warp drive. But frankly, these are quibbles with a movie that is exciting, emotionally-affecting, funny, and incredibly entertaining. 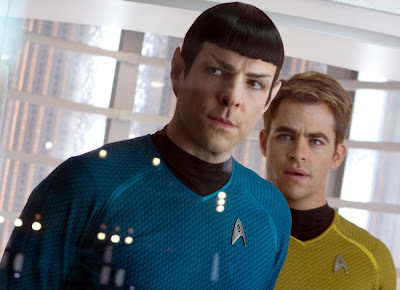 The social commentary about the post-911 age permits this film to live up to Star Trek’s most noble tradition of being about something more than spaceships and lasers, and J.J. Abrams’ penchant for pastiche transforms the film into a meditation about the depth of the Kirk and Spock bond, no matter the universe, no matter the situation. So like The Great Gatsby, Star Trek endures, and finds a meaningful place in the pop culture of the 21st century. And again, once more the sky's the limit...the five year mission begins again. I can't wait to see "what's out there...."
Haven't seen the movie so I can't read the review, but in cases like this I usually skip down to the last 2 or 3 paragraphs, and I'm very happy to see you seemed to have enjoyed the film. I know you had your reservations, so it looks like Abrams overcame them. Very excited about seeing this very soon. Spoiler in my comment: I have seen the movie and agree with you on all points, right down to undistinctive characterization of Khan in terms of the writing. I thought Nero was a pretty generic villain in the 2009 Trek as well, and Philip Seymour Hoffman wasn't very memorable in Mission Impossible III either, so I guess that's a pattern with Abrams. I do think Cumberbatch is an entertaining actor and he brought a style to the character that the writing didn't. Overall though, I really like the movie and it's my favorite of Abrams' movies so far. I’ve been eagerly waiting for your review, and as usual, you did not disappoint. I could not agree with you more about Star Trek Into Darkness serving as a War on Terror allegory, and an exceptionally smart one at that. You picked up a couple of items I missed, in the “private” security used to man the USS Vengeance and also how ridiculous Kirk looked beating up on Khan as a comment about the ridiculousness of torture. There was another subtle comment about the Vengeance belonging to the “Dreadnought Class,” which is an reference to the 1st all big gun British battleship built in the early arms race that helped start World War 1. Also, in an era when so many blockbuster films try throw political or social elements into a film, without having an actual take on them – Star Trek once again blazes a path with a biting, intelligent critique and also takes a firm moral position (in opposition, in this case). Secondly, the film has a wonderful thematic context based on the “What would you do for your family?” comment made by Khan. This question serves as the thematic background of the film, as every character’s (major and minor) are contextualized by how they answer that question. Personally, some of the pastiche elements did not work as well for me as they did for you. On an initial viewing, the inversion of the death scene from TWOK was distracting. It works better for me with subsequent viewings, but I still feel it undercuts Pine and Quinto (who are both terrific in the scene and film) to some degree. Lastly, I loved the opening teaser. It played like the climax of an unfilmed TOS episode and culminated in a spectacular match dissolve to the Enterprise in space that is maybe my favorite moment for the ship since the flyby in TMP. I posted on the film a few days ago, and I’d love your thoughts on my post, if you have the time. John extremely in depth and honest review of this impressive film. Great review, John, and I really enjoyed it—not least for the fact that I disagree on a few points! Whilst I recognise the parallels you draw and the creative possibilities in tweaking an established timeline rather than completely ignoring it, it feels to me somewhat underwhelming to have Khan show up in Into Darkness—as wonderfully as he was portrayed. As I understand it, Abrams wanted to free the franchise from the shackles of the past with the reboot, yet for me the final act of the movie became somewhat predictable given the beats The Wrath of Khan it revisited to a fashion, and that pulled me out of the movie. Also, the War on Terror allegory just seems a little tired to me at this point; I agree that the relationships and attitudes of the central characters make for something of a novel statement on the topic, but I feel like Star Trek has the possibility to be much more forward-looking rather than the introspection we get here. 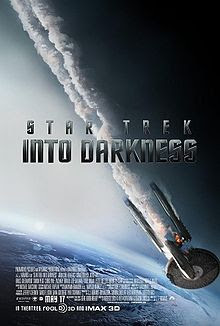 I get the point that the denouement of Into Darkness "rights the ship" in much the same way as it implies the USA may still need to do, and I also very much look forward to where the third movie takes us, but I hope it finds the Enterprise able to explore strange new worlds once again. There are a myriad of stories yet to be told in this universe, and for me—whilst it was a spectacular ride and the Kirk/Spock/McCoy dynamic is pitch perfect—I would like to see this reboot set its own, entirely new course from hereon out. All that aside, though, it was great to read your perspective, and it may yet have me re-appraise the movie to some degree in the inevitable future viewings! In response to Adam's comment above, I too enjoyed Into Darkness whilst at the same time wishing for a Star Trek movie that strays more into the unknown than the known. Sci-fi is indeed a powerful and entertaining backdrop for allegory and metaphor, especially with a universe as rich as Star Trek's, but as a genre it is also uniquely placed for the inventive writer to imagine and explore totally new dilemmas and ideas. There are many movies that manage both, such as Blade Runner and Gattaca, and I feel that by grounding his Star Trek efforts so firmly in allegorical territory Abrams perhaps makes the Trek universe a less vibrant and interesting place than it needs to be. This is something I feel Star Trek achieved with the greatest frequency during TNG, specifically with the exploration of the line between man and machine (think the Picard vs Riker courtroom scene, in my opinion a real high water mark) and with the rise of the Borg as the faceless cybernetic hivemind. With his third film, I would love to see Abrams really make use of sci-fi as a genre rather than (or perhaps as well as) making use of Star Trek as a universe. One of the reasons we create elaborate fantasy universes is to explore ideas not possible in our own, as well as to arrange them into entertaining metaphors. Agree 100% with your assessment. Seen it twice already -- once in 3D and once in 2D (3D was a waste at twice the price and added nothing whatsoever, BTW) -- and enjoyed it immensely both times. They probably should have left the whole Khan thing alone and just made Cumberbatch's villain a new character, though. Wouldn't have changed the movie a bit. Making him Khan felt like nothing more than an afterthought or, worse, simply a means of setting up Spock's "Khaaaaaaaaannnnn!" scream toward the end. I do find it extremely disappointing that you are really the only critic to even bring up the blatantly obvious "War on Terror" parallels. I mean, it's not even freaking subtext -- it's TEXT. Perhaps it's just my liberal heart bleeding out all over the floor but when a massive pop culture item like Star Trek brings this kind of thing up I get really hopeful that perhaps we can now start to have a truly substantive discussion about where we've gone very very wrong as a nation over the last decade plus. Yes, I'm probably laying waaaaayyyy too much on what most people will see as nothing more than a fun summer time waster but ya gotta dream. J.J. Abrams must have seen the Space:1999 "The Exiles" episode. I see the element that is borrowed. Great film. John, your commentary is brilliant! I caught most of the allegory you mentioned, but totally missed the Kirt-to-Khan torture relevance. After Khan rope-a-doped Kirk into punching himself out, the scene went flat and died. After your analysis, I now see the scene falling flat as incredibly powerful and significant as a conclusion to the futility of the type of veneance that compromises ones ehtics. The "Family" significance that you pointed is wonderful! I would like to add that Khan's primary motivation was his 72 member family as well. Giving both sides had this primary value is indeed what makes the Kirk/Spock friendship the deciding factor, because, as you pointed out, Khan had no friends, at least none out of stasis. To further confirm the strength of family, when the crew was ordered to abandon ship and NOBODY moved, made my emotions well up. "One for all, and all for one!" The most significant stories are those that allegory events and attitudes of their time, like Cassablanca and American neutrality in WWII, The Shawshank Redemption and the potential for errors in the justice system, the Borg and the zombie-like cogs of meat that people feel they are in this world of "One Percenters". Star Trek has always done this. There is no reason that it cannot strive for the far-reaching themes that some call for and still find relevent metaphor to the times we live in. This is what makes Star Trek actually important. An insightful review of the film. My only problem with the film (well, aside from the fact I still get cognitive dissonance from the changes to the universe with the reboot - I had no idea how much original Star Trek lore was in my head and I keep expecting the new films to follow that old canon - and the way that the external aerial city shots always make me sing the "Futurama" theme song...) is that Khan is made a MUCH less interesting character than he was in the old universe. They certainly got an actor who was capable of taking on a role played by Ricardo - I was pretty impressed by his performance - but there could have been more complexity and depth to the character he was given. Waited until I viewed the film before reading your spoiler laden review. As usual, spot on. I would like to say one thing about drones however. 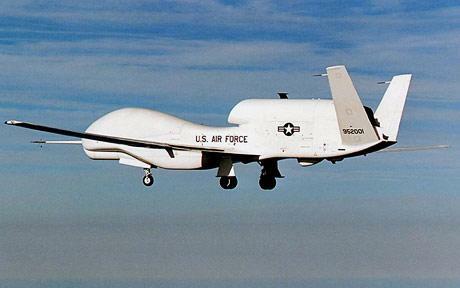 Those family members and friends of our men and women in uniform are thankful of drones. I've been in the USN and my job was support comm for special forces, I guarantee that if not for drones, it would be boots on the ground. Resulting in dead US servicemen. No opinion is right or wrong, I want to make that clear, however every opinion is a matter of perspective and your own personal value system.